I think it's fair to say that Japanese restaurants are few and far between in Belfast. A quick look at Trip Advisor lists 10 Japanese Eateries, 3 of them being fusion. One of my favourite restaurants in Belfast, Yugo, (see my review here) sits in the top spot but I wouldn't categorise it as a Japanese, more of a modern fusion offering but don't let that put you off, it's excellent. Public perception would have Zen at the top of the pile as Eddie Fung's innovation has created a unique niche providing Japanese food in a modern, chic environment. The other three restaurants on Trip Advisor are Gangnan in Botanic that has a food hygiene rating of 2, Yo! then Wagamama which are consistently good but like many large chain restaurants lack a certain character. Then you have Sakura. I'm not sure how many years it has been open but I can't remember a time that it wasn't a presence on Botanic Avenue. I vaguely remember eating here around 6 years ago long before the conception of this blog where I left feeling particularly underwhelmed, however, this was before I realised how good sushi can be. It's only over the past 2/3 years where I have I found my love for Sushi mainly due to discovering the three things that make it sing; Wasabi, pickled ginger and soy sauce, eating sushi without these accoutrements is akin to going on a stag do and drinking sparkling water, a bland experience. Since finding out how excellent sushi can be I have been fascinated by the amazing skills it takes to become competent in the art. The worlds top sushi masters are as much artists and craftsmen as they are chefs with many spending up to ten years perfecting how to make the rice alone. I have been visiting Sakura mainly for quick takeaway lunches for the past couple of years. Avocado & salmon and softshell crab rolls are the usual go tos and Iam always surprised at how busy the restaurant is at lunch-time which is obviously a good thing. 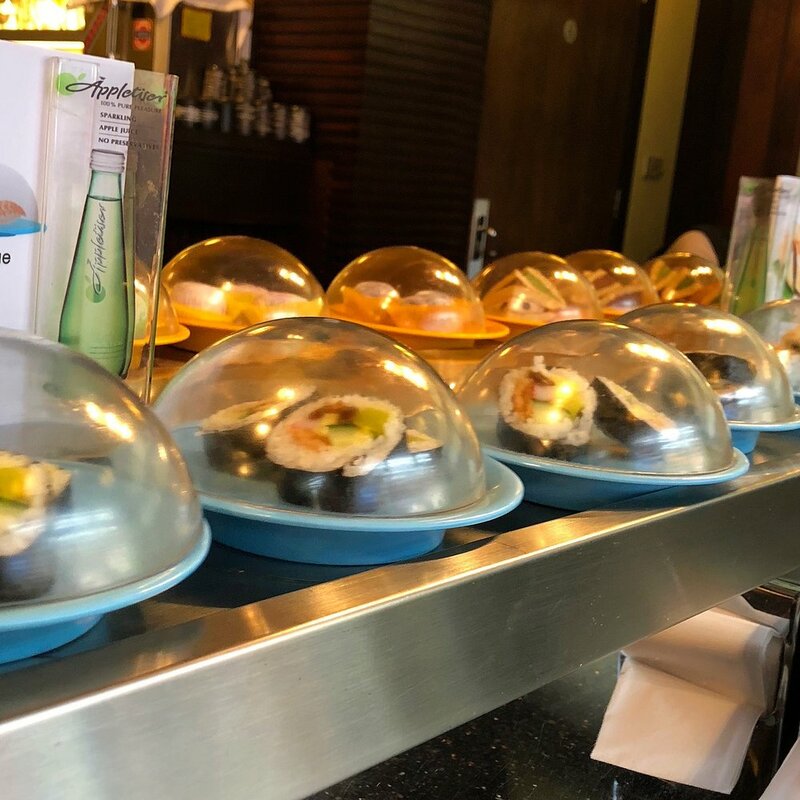 The first thing to notice is the sushi train that rotates around the main dining table. Here you will find a range of sushi dishes on coloured dishes with each colour donating a certain price. You can simply grab what you fancy and eat to your heart's content and when finished your empty dishes are totalled and you can be on your way. Convenient, quick and you can be in and out in less than half an hour if pressed on time. I opted away from the sushi train and ordered my usual soft shell crab and avocado rolls that have to be made fresh. The soft shell crab rolls, in particular, are probably one of my favourite things to eat at present. The avo is thinly sliced and fresh, the rice is perfectly cooked and seasoned and the softshell crab provides an excellently crisp and salty finish. Combine that with some extremely punchy wasabi, pickled ginger and soy and you have a shear delightful bite of food. As a side dish on the lunch menu, I also went for the Kimchi chicken and boiled rice. I usually love kimchi but Sakura's version was more like a sweet chilli sauce soup which completely overpowered everything else on the plate. It is fair to say that sweet chilli sauce is my food pet hate so I'll refrain from writing anything further on that dish. To sum up, the Sushi is definitely worth a trip and given the lack of competition, it is probably as good as you will get in Belfast, for now anyway. I also clocked the tempura which looked highly appealing but if the other main dishes are similar to the sweet kimchi chilli chicken I would probably avoid and stick to what they do best.